Thousands of refugees enter Serbia every day on their route to Austria, Germany, Belgium and Sweden. They hope to start a better life. They’re looking for a life without the violence and terror they experienced in their home countries of Afghanistan, Syria or Iraq. Ana Zivkovic is a communication officer for Caritas Serbia. She explains what kind of services Caritas Serbia is giving to the refugees, what the challenges are and how she personally feels about their situation. In September, Caritas Serbia started a project which is going to last four months until the end of December. Since winter is going to come soon we will also consider special aid during the cold season. It’s already getting colder, so we’re going to provide 5000 sleeping bags and rain coats for children. We distribute hygiene kits in the refugee centre in Preshevo, in the south of the country, where the refugees are coming after crossing the border to Macedonia. 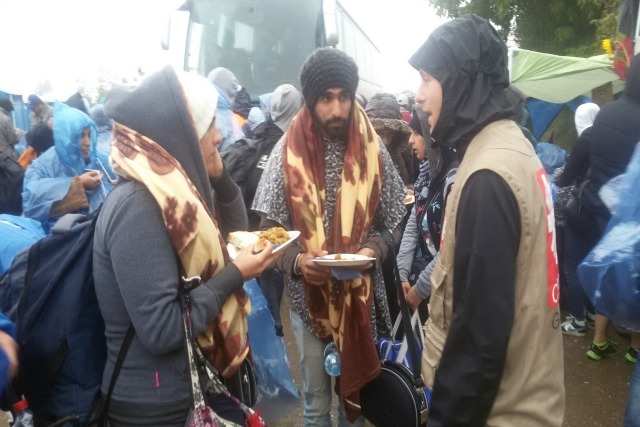 We started distributing hygiene items in the north, on the border with Hungary, in the two centres in Subotica and Kanjiza, but since the border with Hungary is now difficult to cross there are less and less heading to north. “Lory is a 19 year old girl called, student of construction equipment and machinery. One of her brothers is a disabled person and he is transported in a wheel barrow. Abdil Helim is a 21 year old young man from Syria. He heard that there are too many people heading to Germany and he was thinking to of trying to go to Sweden. He told me ‘I only want to go somewhere me and my brother could study and have a normal life again’”. With the help of CRS, Caritas Serbia are also able to distribute hygiene items in the park near the Belgrade railway station, where many refugees stay while waiting for their transport to get close to the borders. Soon we will also provide sanitary facilities with showers in this park. As for distributing food we are – since most of the refugees are Muslims – distributing fish, canned sardines, bread and some cake. And of course drinking water. We are also distribute hygiene kits, different for women and children. For children especially nappies, tissues, baby powder, cream, fruit juices and for women sanitary pads, gel for the dry disinfection of hands, toothpaste, toothbrush and wet tissues. Furthermore we are supporting Preshevo in handling their garbage problem. The reason is that there were not enough containers for the garbage of so many people coming into the country. So Caritas Serbia will provide twenty containers to help the municipality solve the garbage problem. This is also essential to avoid potential diseases and to make sure that the hygiene level is safe. Caritas will provide electricity plugs and an internet hot spots at the admission centres on north and south, so the refugees can communicate with their families. Unfortunately we cannot build shelters without consulting the state’s Commissariat for Refugees. But the government is already planning these activities and is responsible for that. The prime minister announced that there will also soon be a big centre for the refugees in Belgrade. It will accommodate about 4000 people. Caritas Serbia is considering to increase its aid activities there once this centre is open. The refugees are not only at the borders but also when you walk the streets of Belgrade where thousands are living and sleeping in the park and other places. And if I put myself in their shoes, I can imagine how hard it must be to leave everything and travel with only one backpack. It moves me a lot when I see so many people with small children travelling such a long way under such hard conditions because it is not like a trip where people enter one bus and travel for 30 hours to reach their destination. They have to change buses and ships, they have to walk and then search for another way of transport. It is such a long road and it seems so hard. But the circumstances that made them escape must give them a motivation to take all this. Personally, we people from former Yugoslavia, from Bosnia, Serbia and Croatia know how it is like to be a refugee because unfortunately we had experienced this in the past. Many people here know how it is like to lose everything and to start life over, so we have to have great compassion and help them as much as we can.